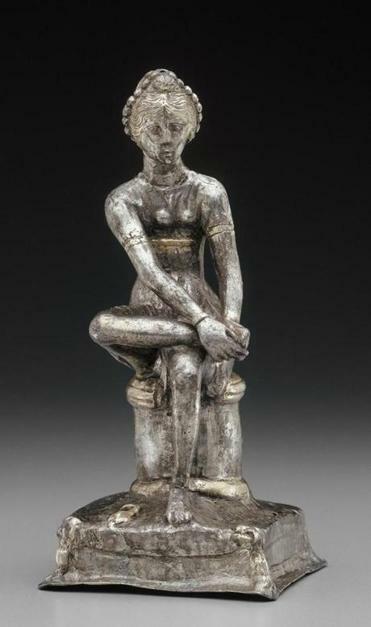 Seated dancer figurine (late fourth century CE, Greece). Ballard’s point, arrestingly made, is well taken: In the late 20th century, suburbanites in affluent countries had more leisure time, more money, and more space to experiment with new occupations and attitudes. They did so with gusto, often leaving urban elites — the people who thought they were driving the agenda — looking nostalgic and unadventurous by comparison. Fine. So wheel back two millennia to the great Roman Empire — at its peak, under Trajan (98-117 CE), well over a million square miles, and by the fourth century encompassing more than 100 provinces. What was the relationship between the center and the periphery? How did these people — who amounted to 97 percent of the Empire’s population — experience life as “provincials”? How did they relate to Rome, the Roman elite, and to Rome’s official idea of itself? In thrall to the idea that Roman ideology, propaganda, engineering, and military might during the so-called “pax Romana” — the 200-year period of relative stability beginning with Augustus — were all spectacularly effective, scholars looking at material culture have been taken up with finding Roman influences everywhere. They found them — and not just because they were looking for them. They are there. (In the same way, during the so-called pax Americana, you could buy Coke in the foothills of the Himalayas, Big Macs in Tripoli, and M-16 rifles throughout Southeast Asia.) But such clues to the existence of a dominant culture scarcely tell the whole story. So what remained of provincial culture in the Roman empire, in what ways did it thrive, and how much was the process of influence actually two-way? How much did the provinces affect Rome? This show, backed by a catalog with 15 scholarly essays by experts in the field, wants to know. Beautifully installed, it’s a rewarding experience, although you emerge from it wondering if the subject isn’t simply too ambitious. 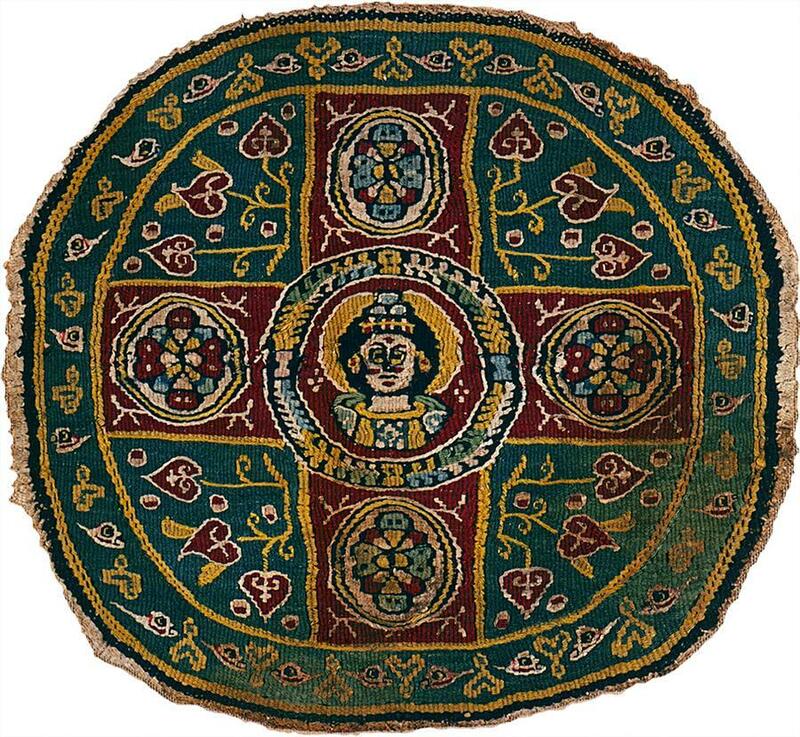 Textile roundel with nimbed bust (possibly the goddess Tyche, fifth-seventh century CE, Egypt). The objects themselves are, by and large, small: gorgeous textile fragments (lent by Donald and Barbara Tellalian), pitchers, figurines, coins, column capitals, horse trappings, vases. There are also some stunning mosaics, sculptures, and wall paintings. Each one has been chosen in large part, you feel, because it is so mysterious, so challenging to received wisdom. It might suggest, on the one hand, an adaptation to Roman influence, and yet, on closer inspection, the persistence of preexisting religious beliefs, customs, or decorative traditions. Thus, the whole show is fraught with subtle questions of interpretation, many of which must be left open-ended because who, in the end, can be sure? And then of course there is the fact that the empire was so vast and so much in flux, and the provinces so heterogeneous, that as you navigate the show it can be difficult to be sure where you are geographically, let alone in what era, unless you do a lot of close reading of the small print on the labels. Nonetheless, the exhibition makes its overall point well. The upper gallery is devoted to objects made for public settings. Many of them dance with ambiguity, respecting official (Roman) culture while also promoting older allegiances. A number of objects, including a textile roundel made in fifth-to-seventh-century Egypt, seem to show the Greek goddess of fortune, Tyche. But her mural crown is deliberately ambiguous and could easily be interpreted as the halo of a Christian saint. Marble bust of Julia Domna (203-217 CE). 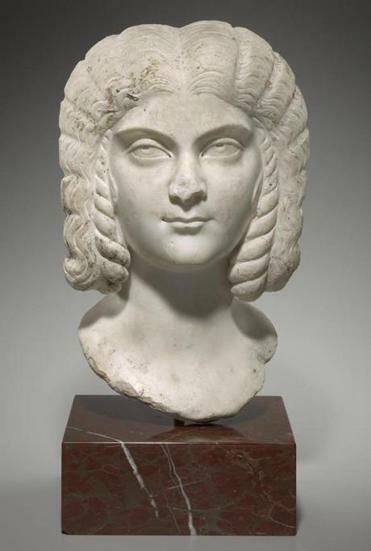 Other works, including a stunningly vivid marble bust, show Julia Domna (170-217 CE), the Syrian-born empress. Her husband, the emperor Septimius Severus, was born in Africa, while their son, Caracalla, was born in Gaul — a poignant reminder that power often moves, at least in individual cases, from the periphery to the center. Julia Domna, who grew up speaking Greek and Aramaic (Latin was only her third language), is also represented in a tiny ivory carving, part of a toy doll of a kind given to elite girls to encourage them to emulate the beautiful empress. Nearby is a Greek inscription, in marble, saluting Julia Domna in the temple of Artemis at Dura-Europos in present-day Syria — thanking her, perhaps, for using her position of influence to intercede on behalf of her native region. Dura-Europos was a trading city and Roman garrison town on the Euphrates. It succumbed to a Sasanian siege in 256 CE, but was miraculously preserved, and in the 1920s and ’30s it was excavated by teams from Yale University and the French Academie des Inscriptions et Belles-Lettres. Among the discoveries were the earliest known Christian baptistery, a Jewish synagogue richly painted with biblical scenes, and a temple of the ancient cult of Mithraism, as well as all sorts of evidence relating to the Roman military, to commerce, and to everyday provincial life. In 2011, Yale University’s Lisa Brody and Boston College’s Gail Hoffman organized a marvelous exhibition at the McMullen devoted to the full range of the discoveries at Dura-Europos. That show gave them the idea to explore this larger theme of the relationship between Rome and the provinces. Although it was ultimately vanquished by the Sasanians, the Roman military force at Dura-Europos does trigger key questions about the role of the imperial army. Since it was largely made up of soldiers from the provinces, and since it was so mobile, the army played a huge part in transmitting cultural influences around the empire. Not only did it absorb weapons technology and military techniques from the foreigners it subdued, but it also spread artifacts and customs rapidly around the empire so that, for instance, Celtic belt buckles from the farthest reaches of the western empire were found at Dura-Europos, in the east. Interestingly, according to one of many fascinating wall labels, the citizens of Rome worried that their soldiers were becoming “barbarianized” by their exposure to foreign customs. The soldiers, on the other hand, saw themselves as the most Roman of all peoples. 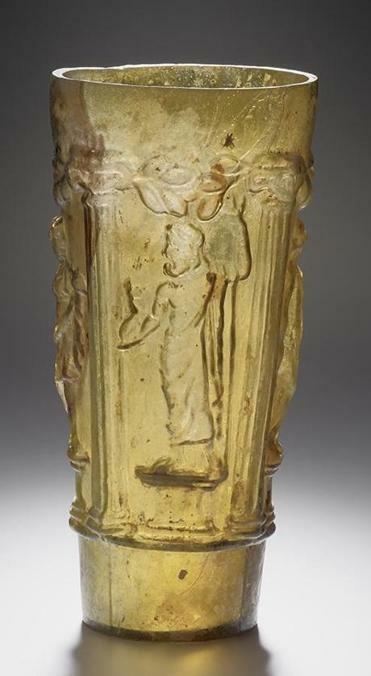 Seasons beaker (first century CE, Eastern Mediterranean). The lower-level gallery is focused on private settings — dining, dressing, praying, funerary rites, and trade. The range of objects alone is exciting: One goes from a child’s tunic made from linen to a silver pitcher adorned with scenes depicting Bacchus, a woolen textile fragment showing a rooster, and a beautiful Greek figurine of a seated dancer from the late fourth century CE. The latter figure, whose pose echoes the famous Greek figure of the “spinario” — the boy removing a thorn from his foot — is from the Museum of Fine Arts. According to the wall label, the dancer was probably also a prostitute, making her part of a sad sorority addressed again 15 centuries later by Edgar Degas. Degas’s popular pictures of ballerinas in tutus show us young girls who were also, in most cases, obliged to sell their bodies. One sub-theme of the entire show is the ongoing relationship between Rome and the peoples of Greece and Macedonia. Although both were subdued during the Republican era, well before Augustus, the Greeks continued to exercise a strong influence on Rome. They had long ago been reduced to the status of provincials and openly patronized for their political naivete, but their cultural inheritance continued to be revered. This nuanced dynamic is one of many that play out across the show, a reminder of how many fresh and powerful stories even the humblest of objects can tell.